People in New York City now have another option for the gender on their birth certificate. A measure passed by the city council last September went into effect today. It allows birth certificates to be updated with three options: M, F, or X.
Additionally, transgender New Yorkers no longer need a letter from a doctor to correct the gender on their birth certificates. Instead, it’s enough to bring in a notarized affidavit that explains that the gender marker needs to be updated to affirm one’s gender identity. 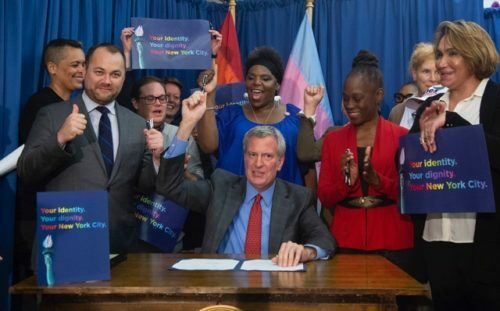 “Transgender and gender non-conforming New Yorkers deserve the right to choose how they identify and to live with respect and dignity,” said Mayor Bill de Blasio in a statement. “I have long advocated for this gender ‘X’ category option and I am proud that New York’s birth certificates are now as inclusive as our City,” said City Council Speaker Corey Johnson.